"Are you alone out here? What are you doing so deep in the jungle?" Disney has debuted the first official teaser trailer for Jon Favreau's new The Jungle Book movie, starring Neel Sethi as Mowgli. This is only a first glimpse but it looks to be a very spectacularly-realized CGI movie, with all of Mowgli's animal friends looking incredibly realistic. The voice cast includes Bill Murray as Baloo, Ben Kingsley as Bagheera, Idris Elba as Shere Khan, Scarlett Johansson as Kaa, also featuring Christopher Walken, Giancarlo Esposito, Lupita Nyong'o and Emjay Anthony. I'm very impressed by this footage, and I'm curious to see more of what it looks like beyond just a few quick shots thrown together. Everyone needs to take a look. For more updates, follow @DisneyStudios or as always you can follow Favreau's account @Jon_Favreau. 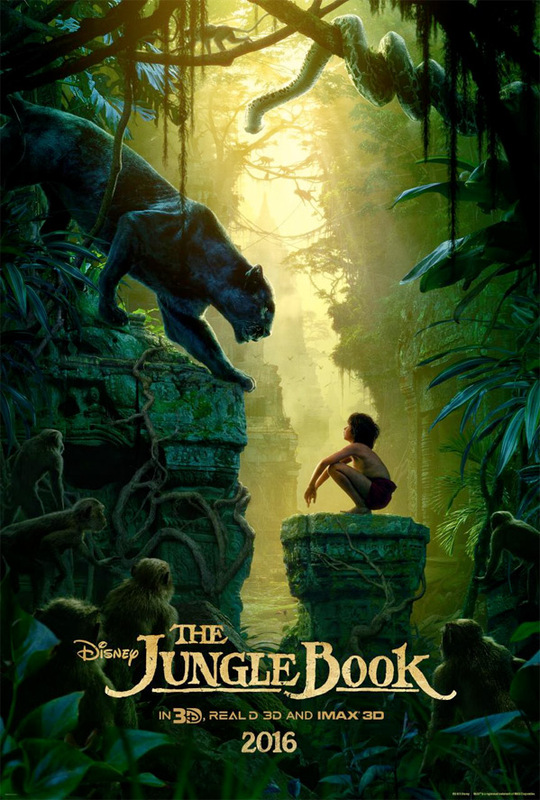 The Jungle Book is directed by Jon Favreau (Iron Man, Cowboys & Aliens, Elf, Zathura, Made) and written by Justin Marks (Street Fighter: The Legend of Chun-Li), based on Rudyard Kipling's classic book of the same name. The film follows a young boy named Mowgli, a man-cub raised in the jungle by a family of wolves, who embarks on a captivating journey of self-discovery when he’s forced to abandon the only home he’s ever known. Ben Kingsley, Lupita Nyong'o, Christopher Walken, Idris Elba, Scarlett Johansson and Bill Murray voice the animal characters. Disney will release The Jungle Book in theaters on April 15th, 2016. The Panther looks amazing. Great job to all the VFX artists. I did not expect to feel that much emotion from this production. This may be the first live action Disney adaptation that I'll like. Maybe. But I am remaining optimistic. It looks great. My only gripe is Disney's weird decision to cut this trailer to make it look like a "gritty" drama. Why not embrace the high adventure of it all and cut a trailer to fit that tone? Tigers, Panthers, and Bears are gritty life threatening animals. Not to mention that damn snake! I thought they were touting this as a "live action Jungle Book"....this is 100% CGI, or am I wrong? Anyway....CGI artists still have some learning to do when it comes to realistic animal (and human) movements. I know right! They needed to use live dangerous flesh-eating animals around this little boy. How dare they. That would have been awesome. It does. Oct8plus is wrong. The boy is real and only partly edited with additional CG. The CG / Real line was blurred enough to fool him. CGI is artificial. It will never truly resemble real life anything. Which is why you prefer Toy Story to 2001? Interstellar? I prefer Toy Story as a complete film to Interstellar (better characters, more original plot, better script in general), even though the VFX in Interstellar were stellar ( that film didn't use CGI to animate living creatures - it used it for machines and abstract space stuff...and it used a ton of practical effects and cinematography besides.) 2001 was 100% live action practical effects. Not a byte of CGI. And a far superior film to Interstellar. Both Toy Story and 2001 were pioneers of cinema that opened the door to entire genres. Interstellar is derivative of 2001. This is also likely to not be final CGI/FX work. they don't release an official trailer with unfinished cgi. They do. Although they do try to make the shots for the trailer to be near-finished, it usually still inevitably goes through some minor changes or polishing before it ends up in the finished film. Sometimes they even update the CGI from the theatrical film for the Bluray. happens all the time especially for a "teaser"
Wow, honestly I'm impressed. Johansson's voice is very foreboding, I like it, color me intrigued. Another CGI f*** fest. I'll pass. I was skeptical at first when this was announced, but it looks better than I thought it would. I'll wait for a more defined trailer to decide. Very impressive... across the board, great trailer. Yep, it's kind of creepy to me, not like the original one. I feel kind of like this could have benefited from just being an animated film. The computer generated graphics pull me out of trailer. Awesome voice cast. I'm guessing this teaser is cut to be more intense than the actual movie. I've been reading the book to my 4 year old recently, so it'd be nice if I could watch this with him. Not to be mean, but I'm hoping not. You are too...be honest. Nothing mean about that. And yeah, a more grown up version would be more enjoyable. I can always watch one of the earlier incarnations with my son. Isn't Warner Brothers developing a more grown up version? I bet this will have the same tone as Pirates of the Caribbean and Lone Ranger. Yeah, that's about the tone I'm expecting, too. Interesting, I hadn't heard about the WB version. I saw the original during the first release...(old, right?) Sleeping Beauty, also, by the way. It was the first sold-out movie that I attended. Kids were everywhere, and the movie was awesome. That being said, this could be, also. That was a great trailer! That snake almost made me sh#t!! Didn't expect much but it was a pretty cool trailer. could work...as long as they don't start to sing & dance ! Even if the CG is unfinished, I doubt the final movie will look much better. It looks like a video game. I would have preferred an animated feat. with the same voice cast! Scarlett Jo is played out. Please recast her as Black Widow. This trailer does not make me want to see this. Redbox $1 rental at most.